I recently read a discussion on LinkedIn where local florists were discussing the losing battle they’re fighting against the powerful national online florists. These big national or international sites have huge marketing budgets and spend incredible amounts of money on SEO (Search Engine Optimization), which includes creating hundreds of city landing pages that rank very well for local searches, and siphon away web traffic from real local florists. While this particular issue is specific to florists, I’m sure there are many other industries that face similar cannibalisation threats from big national retailers. So how does a small to medium business survive against these giants with massive marketing budgets? The answer is quite simple really… create a strong Google Local Listing, or Google Places for Business as it’s also known. 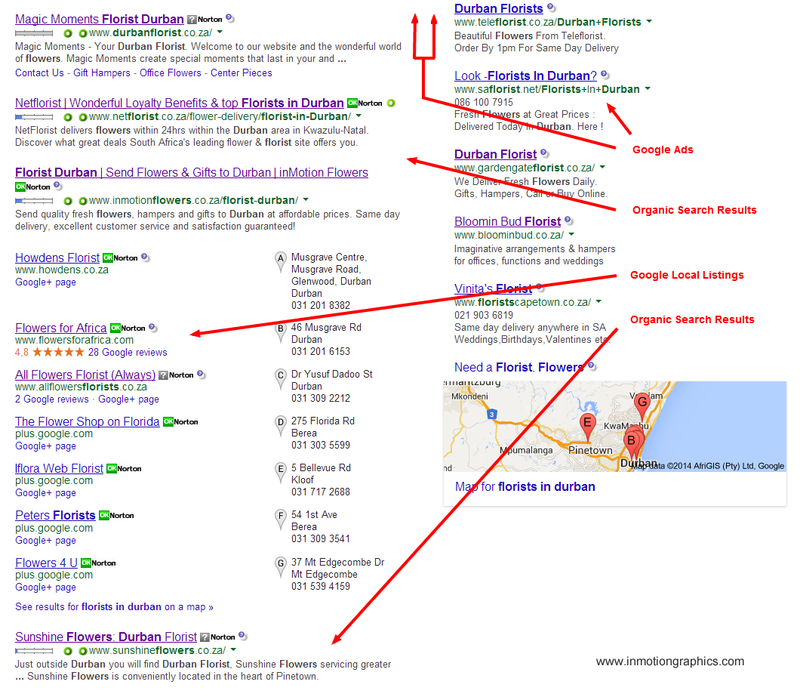 Now in case you are wondering what a Google Local Listing is and what it looks like, here’s a screenshot of it in the wild, as seen in a typical local business search for “Florists in Durban” (click to enlarge). In a typical local business search on Google, you’ll usually see a block of up to 3 ads at the top, then a block of up to 3 organic search results which link straight to company websites, and then a block of up to 7 local listings. In the SEO world, this block of local listings is commonly referred to as the 7 pack. For some searches Google could return a 3 pack, and we’ve also seen the occasional 10 pack. At the end of the local results you’ll find a link that says: “See results for “your search phrase” on a map »”. Clicking this link will then take you to a list of all the local businesses Google has listings for in this particular industry, with their locations pinned on a map. The results that follow the block of local results are usually more organic search results. Now you’re probably wondering how any of this can help your small business compete against the big boys. Well as it turns out, Google is particularly strict about awarding businesses with local listings. You have to have a legitimate address in the city you are creating your listing for, along with a local landline number, all of which Google will verify before displaying your listing in the search results. For this reason, unless the national online retailers have offices or shops in every town or city, they’ll only be able to claim one legitimate listing. This gives you the opportunity to create a good quality local listing that ranks within the first 7 results in the local listing block. As you can see from the screenshot above, this will put you front and centre on the first page of Google in position 4 – 10. Plus, if you’ve racked up 5 or more customer reviews, your listing will stand out from the rest of the crowd like our “Flowers for Africa” listing. Now although we’ve been referring to “Google Local Listings” throughout this article, we should point out that Google has recently switched their local listings to “Google Plus Local Pages”. This is so that they can integrate local businesses into their Google+ social network. This enables you to enjoy all the benefits of a local listing, while being able to share updates and useful information with your customers and Google+ followers. As to the detailed step by step process of setting up your Google+ Local Page, we’re not going to get into that here, as Google does a pretty good job of it here, plus we’ve included a video tutorial below. If you get stuck or have any questions about the process, post them in the comments below and we’ll happily assist you. Sign in to your Google Plus account. If you don’t have one yet, create one here: plus.google.com. From your Google Plus profile, create a Google+ Local Business Page. Make sure you select the “Local Business or Place” category when creating your page. Wait for your listing to appear on Google. If you are reading this article in an email or RSS feed, click here to watch the video. To get your listing to perform well in the search results, you need to pay attention to a number of key factors that can influence local search rankings. Take the time to write an appropriate description for your business and include important keywords and phrases in a natural way. Do not keyword stuff! Do not add keywords to your business title, unless they are part of your business name. 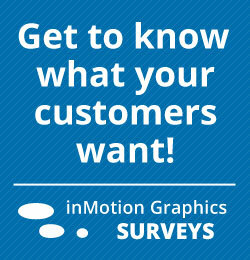 Carefully select up to 10 categories that most accurately describe your business or service. You need to select categories that Google suggests as you type, so you might not be able to find as many as 10. The first category you select will become your primary category, so this is the most important one. Try and make your listing as complete as possible by adding photos, videos (if you have), opening times and payment options. Encourage your customers to leave reviews, but make sure you abide by Google’s guidelines. Do NOT pay for reviews or bribe your customers etc. Add your business to good quality directories and relevant directories in your industry, and make sure you are consistent with your NAP formatting (Name, Address and Phone Number) across your website and all other websites and directories. These will count as full citations if the NAP matches your local page and Google will use them when evaluating the online authority of your business. Use a local landline number that includes the area code of the phone number, which should of course match the area code associated with your city of location. Avoid using 1800 numbers and other non area specific numbers at all costs! You can add these as additional numbers. Remember to keep the format of your phone number consistent across the entire web. Make sure you verify your Google listing… you need to be on the lookout for a postcard from Google with a verification PIN. Include your City and State in the title meta tag of the page you are linking to from your Google+ Local Page. This would usually be your homepage, but could be a city specific landing page if you service multiple cities. Work hard at building the domain authority of your website by “earning” links (rather than “building” links). We’ll cover ways of doing this in another post. For a more in-depth look into local search ranking factors, we encourage you to read Moz.com’s Top 20 Local Search Ranking Factors. We hope by now you are convinced of the immense value in claiming your own local listing for your business if you don’t already have one. This is hands down the easiest and cheapest way of gaining some ground against the big national online retailers, and is bound to get the phone ringing. As the owners of a local florist with a strong online presence, we estimate as much as 60% of our local business from search originates from this listing. If you have any questions or problems setting up your Google+ Local Page, please post them in the comments below. And if you already have a local listing, let us know how it’s working for you. I really feel your pain, and know all about the situation you are in, and how difficult and frustrating it is.